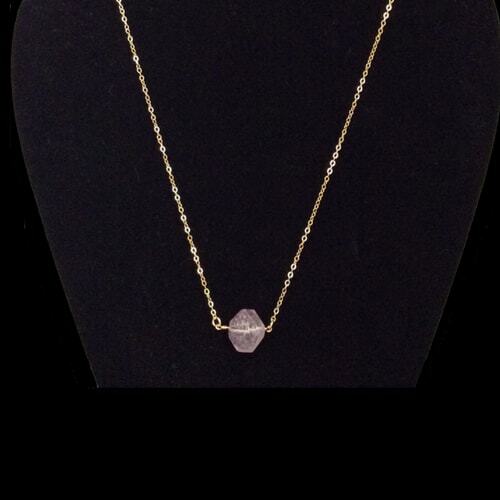 Handcrafted on a US barrier island with faceted one-of-a-kind amethyst and 14k gold-filled chain. 16″L w/ 2″L extender chain. PROVENCE LAVENDER NECKLACE for men and women inculcates a perfect mix of simplicity and stylishness at the same time. If you love the style but not too many details, then this is the necklace for you. The fashion catalyst includes 14k gold and amethyst, enough to leave you shinning all through. Give your outfit a perfect boost and redefine your fashion statement with the 16″ long PROVENCE LAVENDER NECKLACE. The perfect outfit for your anytime of the day outing. They can also come in as a gift item for anybody around you, your family or a special someone. They can come in as birthday presents or an anniversary gift. Whatever the occasion is, the province lavender necklace will always come in handy, just at the right moment. 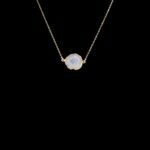 14k Gold and Amethyst: The province lavender necklace comes dipped in gold and amethyst. Shiny precious stones that will add all the class and sophistication to your outfit. they are beautiful, classy, sophisticated and attention-grabbing all at once. 16 inches long with 2 inches long chain extender: The province lavender necklace comes long enough for any neck they are fitted into. Having a 16 inches long 14 karat gold chain and 2 inches long extender chain to hold the amethyst in place. Simple yet stylish design: The provence lavender necklace doesn’t come with bulky details and yet they can make the loudest fashion statement at the same time. The style and design are simple, not complicated but will still create that amazing effect on whatever outfit you choose to go with it. Perfect for every outfit: They can go with any outfit chosen for them. They are very much easy to blend with anything and everything that you have on you and they will still come out as beautiful as ever.